Just moments from beautiful Crescent Bay Beach lies this spacious view home with pool and guest house. The main house boasts wonderful ocean views from its living room and two of the four bedrooms. On the main floor you will find a lovely great room with fireplace, laundry room, full bathroom and a bedroom with patio and pool views. Upstairs the spacious master features magnificent ocean and city views and a secondary fireplace. There are two additional bedrooms on this floor as well as a third full bath. The home also features a finished basement with powder room that could easily serve as another bedroom, gym or office. The beautiful, heated salt water pool and spa create a private backyard oasis, rarely seen in Laguna Beach. An out of sight and fully owned solar power system on the roof can help reduce your energy costs. Above the 2-car garage you will find a wonderful one bedroom guest house with oversized view deck and carport space. 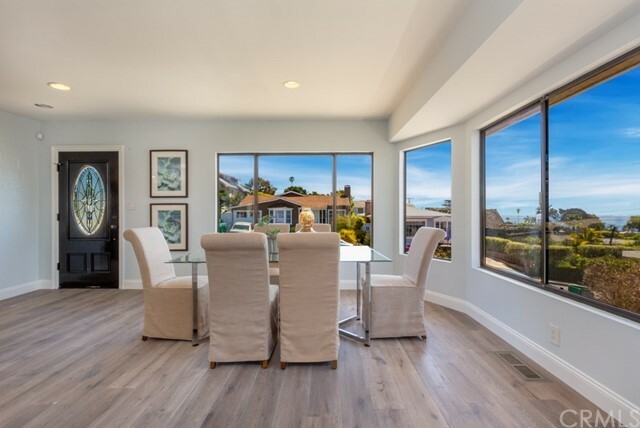 Located near Downtown Laguna, Crescent Bay and Crystal Cove State Park, you will be sure to love this special home!